Last night I bought this for Gracie. When I was a girl, I always wanted a barbie and my parents never allowed me to have one. Something about Barbie’s body being too bangin’. They did give me a chubby and awkward looking Avon knockoff doll instead that was much too big – not nimble like Barbie. It was all in vain – I ended up with plenty of self-conscious body issues anyway. I guess all that sheltering didn’t do me too much good. Anyway, when I was checking out, Amazon was trying to get me to buy more stuff so I could get free shipping. So I looked at some Barbie accessories. I found an entire wardrobe for Barbie and thought of how cool that would be. All of a sudden, my inexpensive present was getting blown into a huge ordeal. I realized I wasn’t shopping for Gracie anymore, I was shopping for myself. For everything I had wanted when I was her age. Had I not stopped myself, I would have been charging a dollhouse in no time. I sat here clicking “add to cart” for her present instead of taking her to a store and watching her add them to the cart herself. Although it sounds easy, sometimes it’s hard being a kid inside still. Because I didn’t feel like an adult, I didn’t feel like I could keep Gracie – keep her safe, healthy and happy. Like I could care for her the way a stable adult could. And now I can never feel like anything but a child because I couldn’t take care of my own. Now, I covet toys. I guess there is still a part of me that hasn’t been overtaken by my adult cynicism and aloofness. I put together puzzles when I need to clear my head. I read children’s books when I need an escape. Perhaps it’s because as a child was the only time I didn’t feel like a major screw-up. I wish to Gracie all the toys her heart desires. I hope she grows in a woman who knows a way to evolve, more than just how to diminish. i love toys. and i think it is importnat that we buy a doll house stat. we were robbed of a childhood. 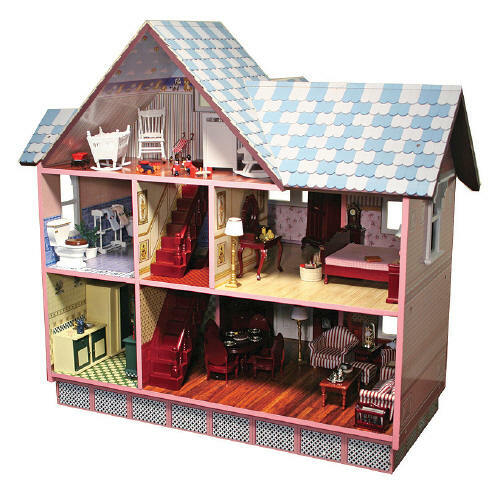 you can come over and play with my barbie house if you want. it's a hand me down and kinda jank now but i loved it when i was little. my niece is getting a doll house this christmas. i'm pumped. melinda – saturday night: carbonara and searching online for a dollhouse. the only problem is, we'll fight over whose house it will stay at. oh well – another way to relive childhood. shelby – we can't be playmates, you might as well live on another planet as far as i'm concerned. but if that barbie house is at your mom's, give me her address.